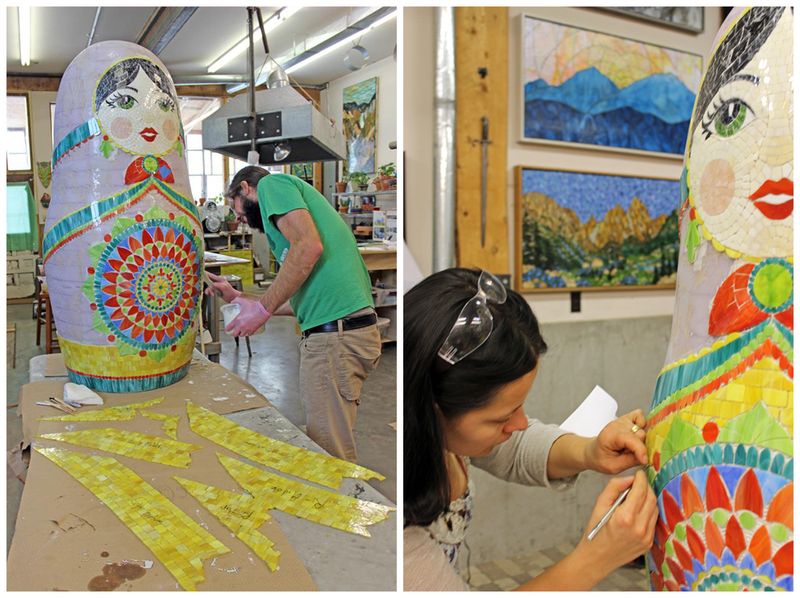 Johona-Mai, Navajo for Sunny Bright Flower was named to honor the Navajo Nation who's ancestral land we inhabit. She was created in Alamosa, Colorado - the land of 'Cool Sunshine'. To reflect our region, we incorporated Southwestern colors, focusing on the bright blue of our big, clear sky and the warm yellow of the ever present sunshine in the San Luis Valley. 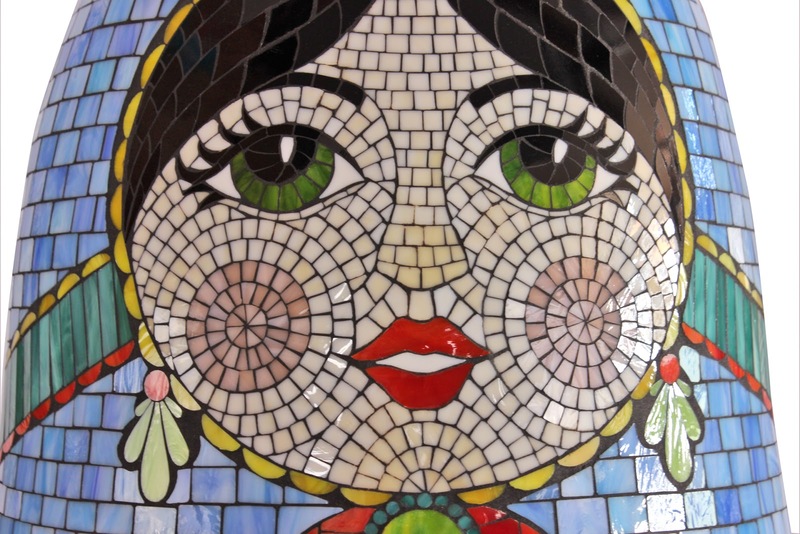 Johona-Mai was sculpted by hand and is adorned in a modern, colorful, hand cut stained glass mosaic pattern. 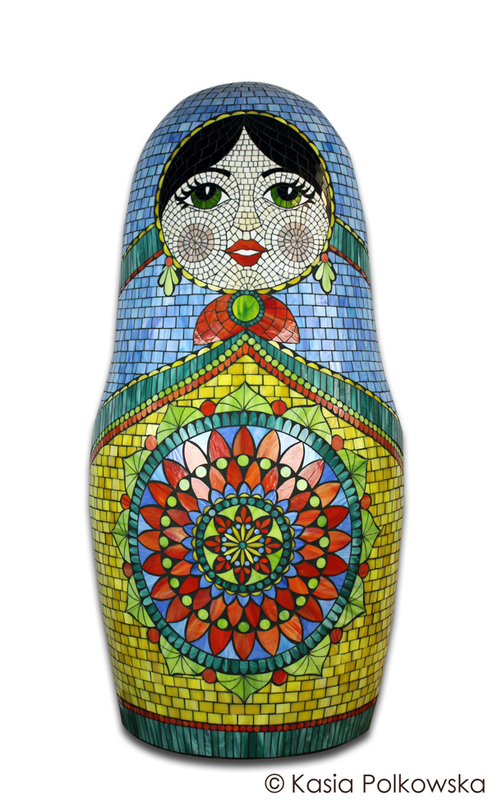 Her form originates from Russia, where the first Matryoshka Doll was made and has since become a symbol in Eastern European Culture where Kasia was born. Today the doll has a place in contemporary pop culture around the world. 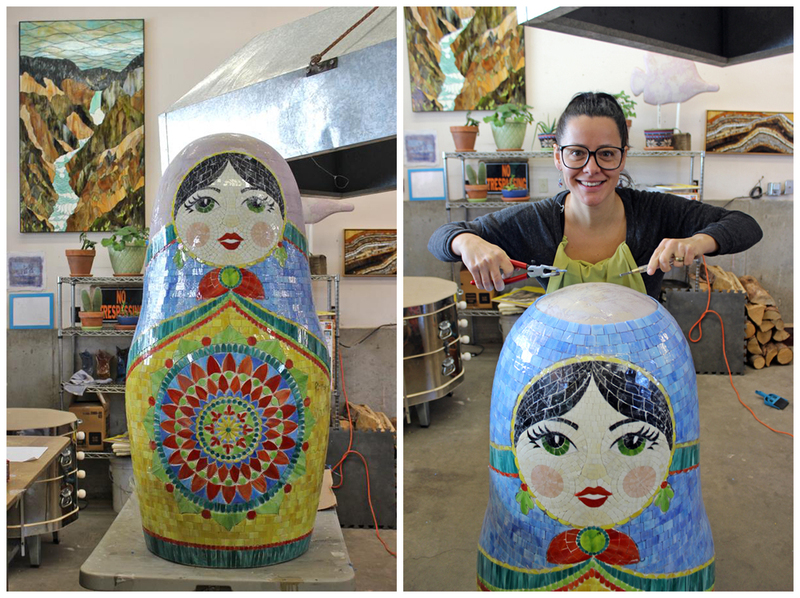 The form of our doll was kept traditional to inspire the nostalgia one often feels when laying eyes on a nesting doll. 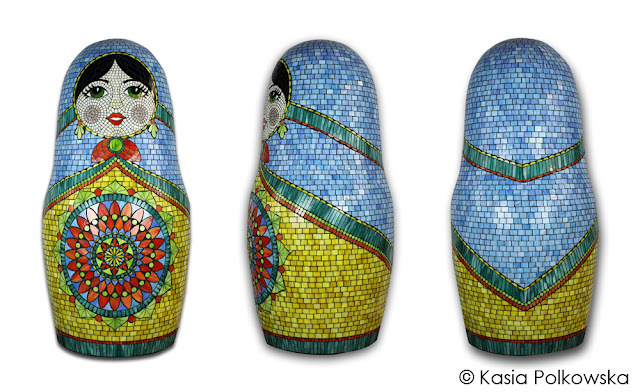 The decorative motif highlights the purity of the form with color, pattern and the innocence of a flower often present on traditional dolls but with a contemporary flair. The sculpture is adorned in an exquisite pattern that can be admired from any angle. Detail of face - all glass is hand cut custom for the doll. The mosaic beginning of the mosaic fabrication with basic hand tools. 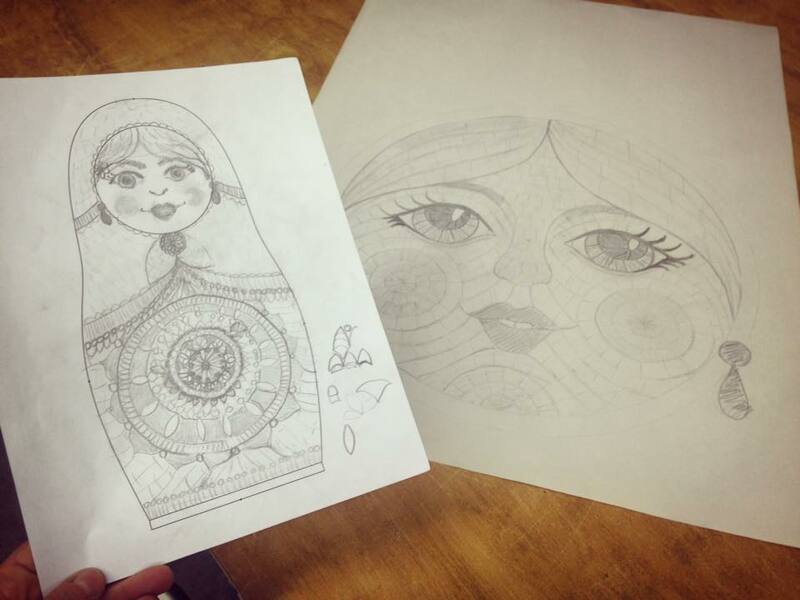 The construction of the custom form designed for the doll. Stacking, gluing, shaping the form. 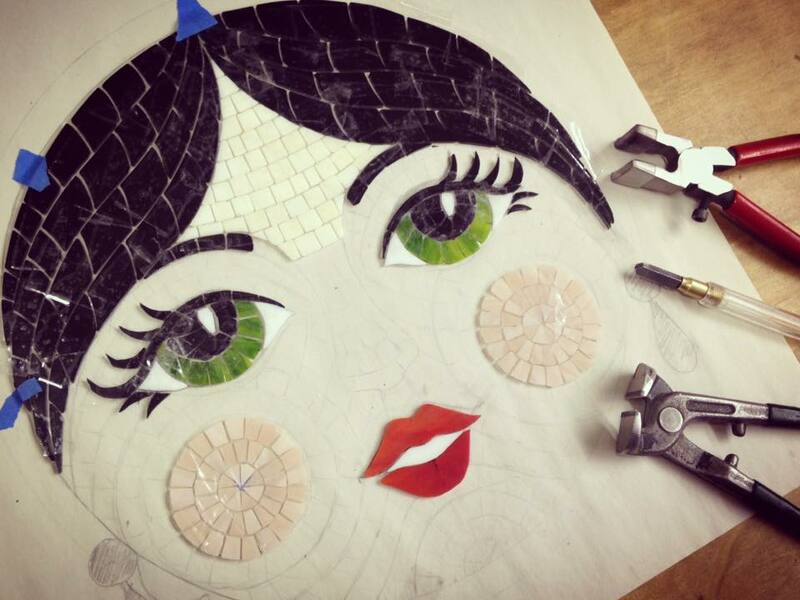 A section of the mosaic cut, arranged, taped and ready for fitting. 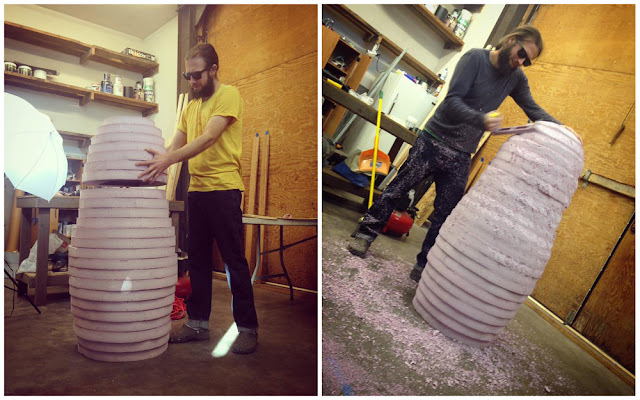 Kyle reinforcing the pink foam form with fiber mesh and epoxy resin. 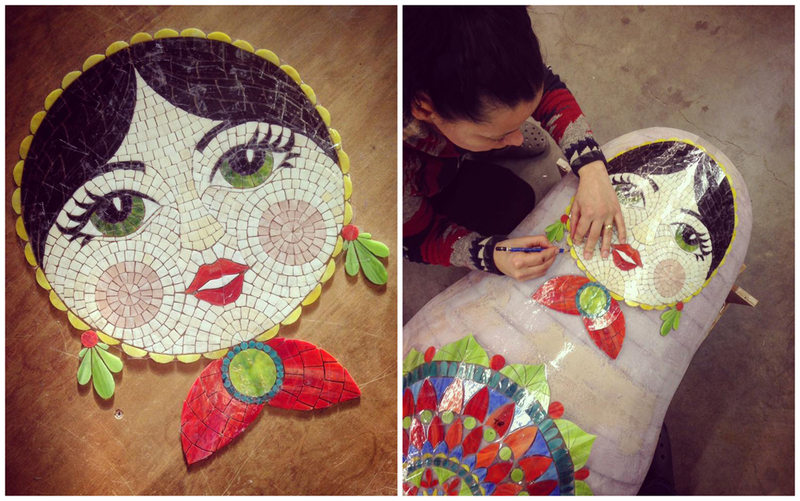 Meanwhile, the mosaic is being constructed and tested against the form of the doll. 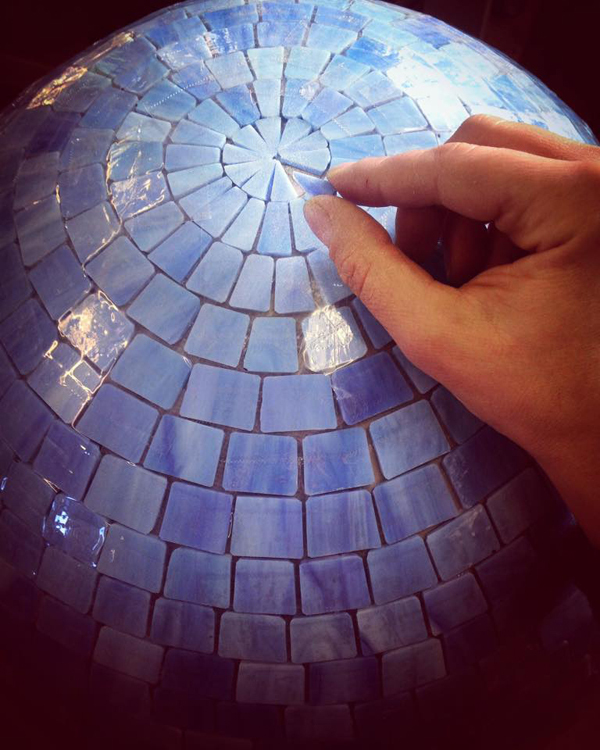 The form is beautifully sculpted and ready to be mosaiced! 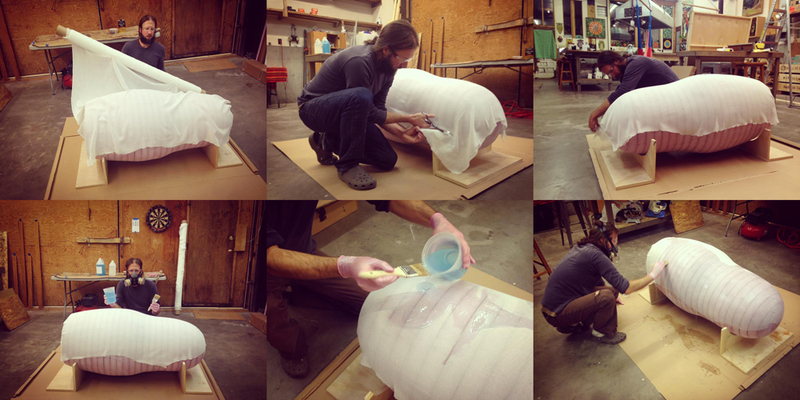 The final fitting and gluing of the dolls face. 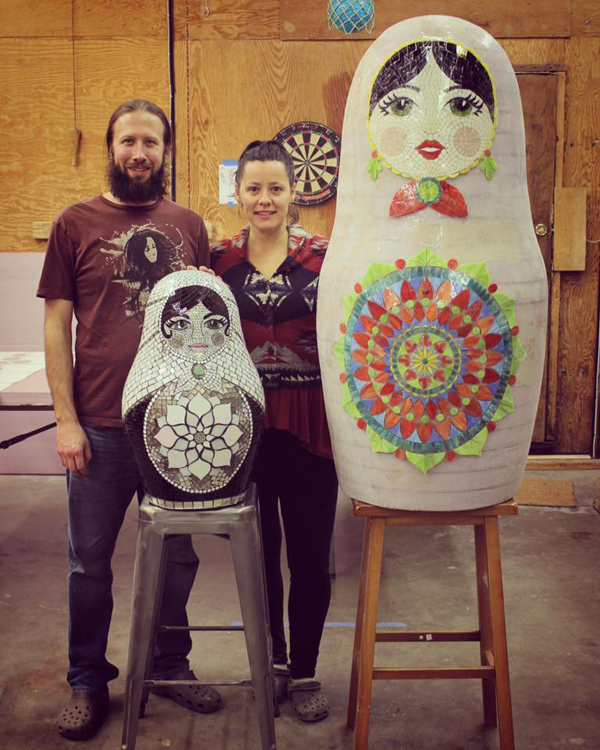 The artists and their dolls, one all finished and the other a work-in-progress. 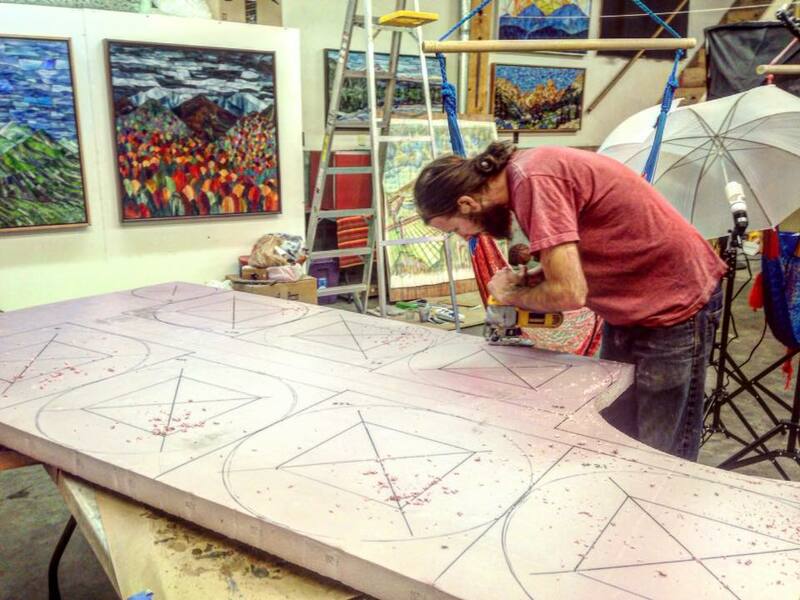 The fitting, gluing, tape peeling - repeat, repeat, repeat! 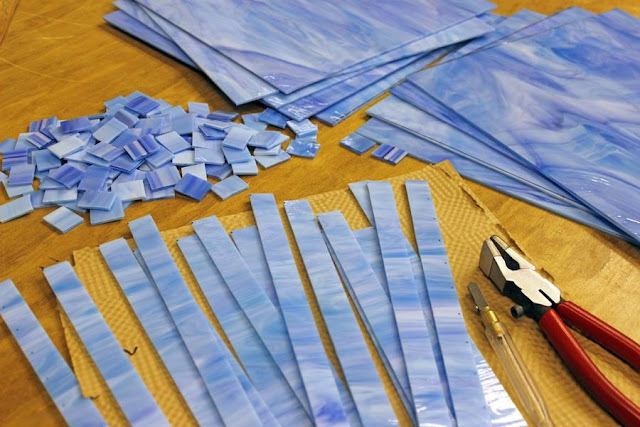 The gluing process for a 3d mosaic is much more demanding than our usual 2d work. More tape peeling and inspecting our glue job. All the glass on the sculpture is hand cut and shaped by Kasia. 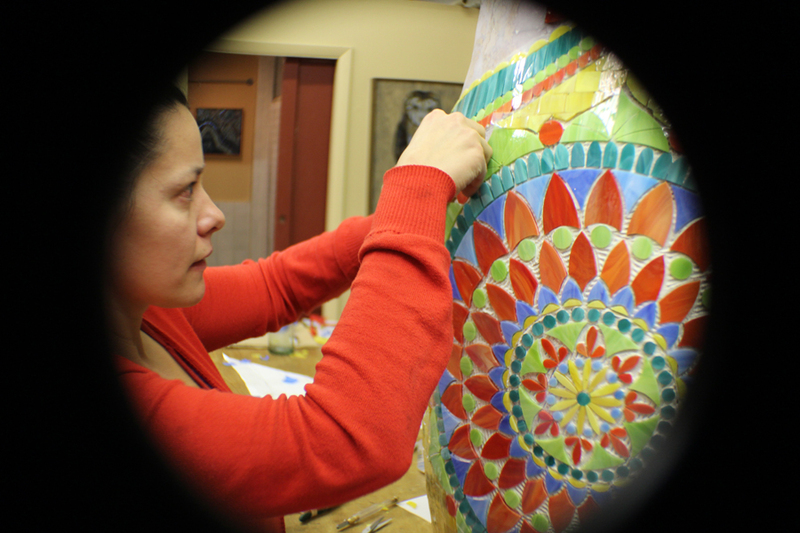 Getting close to finishing the mosaic aspect of the sculpture. 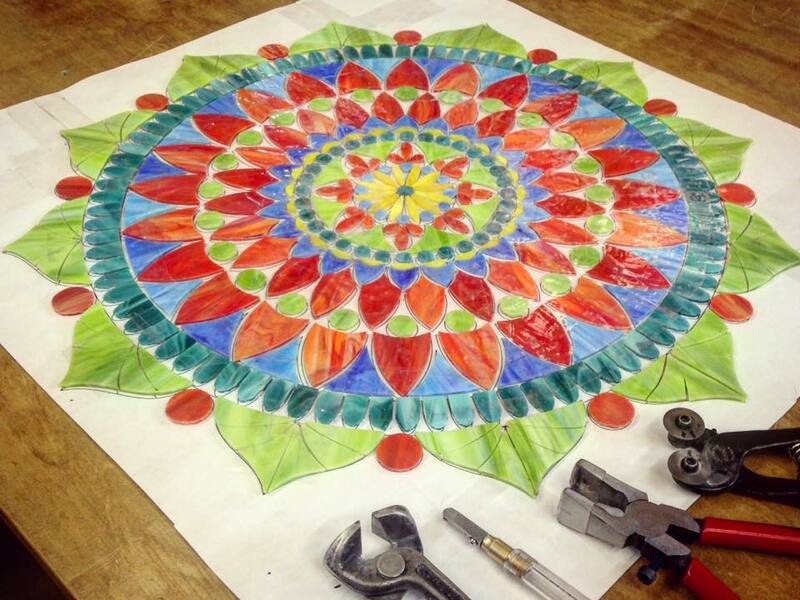 All glued and ready for grouting! This final step was exciting for sure! 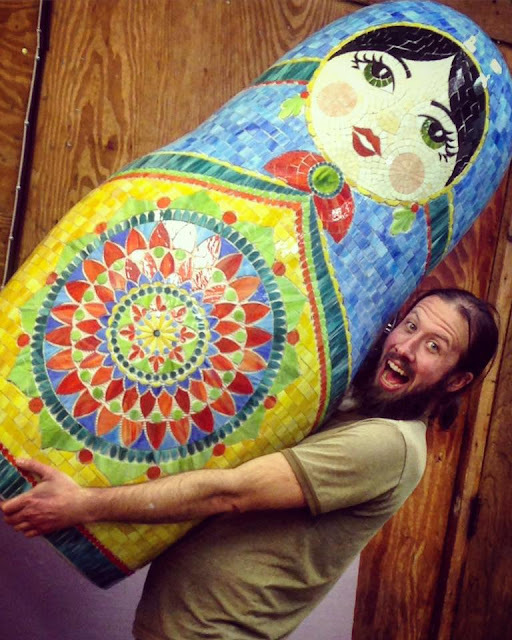 FYI the doll weighs under 60 pounds. 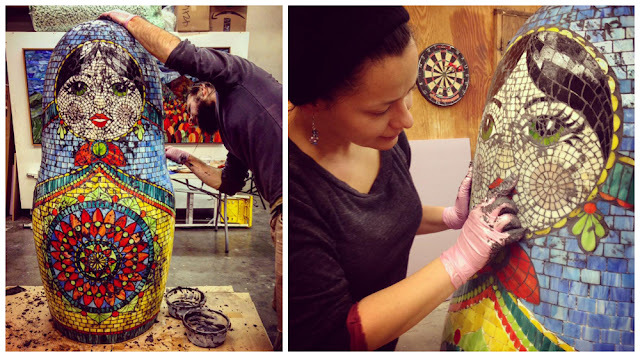 The grouting process - the black really makes the bright colors pop! 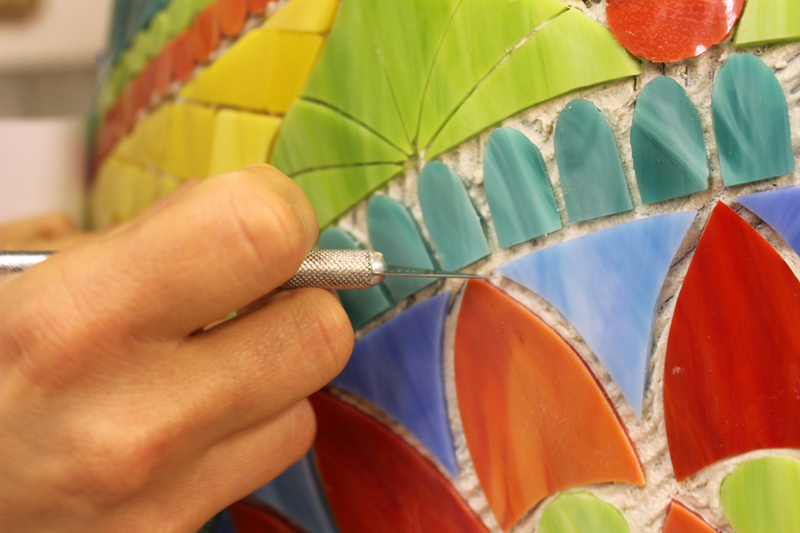 Details of the grouting process. 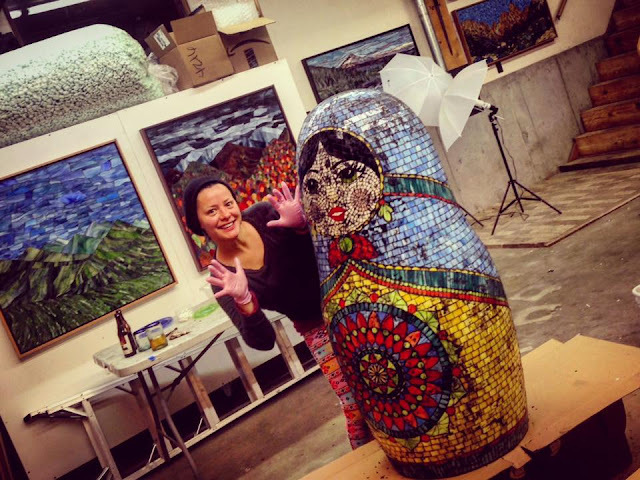 Grouting the doll was tedious but rewarding. Very creative, I enjoyed seeing the process how you put her together. Cool result! This was such a joy to watch! I love these exquisite dolls and mosaics - your collaboration of the two is just lovely! You are bright spot in my Instagram feed! Thanks for sharing the process, it's great to see the detail. Fantastic result. Congrats to you both!